Venture out of the city with trips to Sea World Theme Park (in Main Beach), Surfers Paradise (SkyPoint Observation Deck & Surfers Paradise Beach) and Oxenford (Warner Bros. Movie World & Wet 'n' Wild Water World). Pack the 17th (Tue) with family-friendly diversions at Dreamworld. There's still lots to do: let the kids burn off some steam at South Bank Parklands, take in nature's colorful creations at City Botanic Gardens, take in the exciting artwork at Atrium Gallery at Buderim Craft Cottage, and kick back and relax at Moffat Beach. 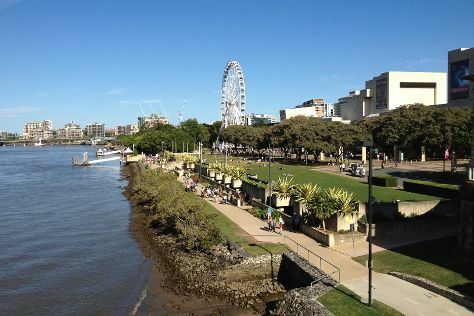 For traveler tips, reviews, where to stay, and other tourist information, read Brisbane trip planner . Paderborn, Germany to Brisbane is an approximately 31-hour flight. Due to the time zone difference, you'll lose 9 hours traveling from Paderborn to Brisbane. Plan for much warmer temperatures traveling from Paderborn in December, with highs in Brisbane at 32°C and lows at 23°C. Finish your sightseeing early on the 17th (Tue) so you can travel to Cairns. Explore the numerous day-trip ideas around Cairns: Palm Cove (Palm Cove Beach, Hartley's Crocodile Adventures, & more) and Port Douglas (Safaris, Four Mile Beach, & more). Spend the 18th (Wed) among aquatic life with a scuba or snorkeling tour. There's still lots to do: hike along Esplanade Boardwalk, take an unforgettable tour with a helicopter tour, make a trip to Green Island, and enjoy unforgettable views with a balloon tour. Getting from Brisbane to Cairns by flight takes about 5.5 hours. Other options: do a combination of bus and flight; or drive. Traveling from Brisbane in December, you will find days in Cairns are a bit warmer (36°C), and nights are about the same (26°C). Finish your sightseeing early on the 27th (Fri) to allow enough time to travel back home.